Our body is a smart and sophisticated machine and when in trouble, it sends us signals in order to do something about it. If your fingers often change their color, be aware that this may be a sign of a very serious condition. This could be a symptom of Reynaud’s Syndrome. 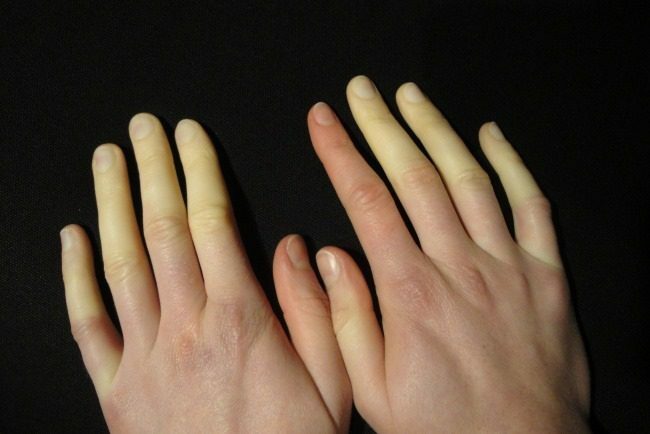 With this condition, low temperatures provoke spasms in the blood vessels, and this leads to a different coloration of the fingers. Sound or rumbling appears often in our stomach. But, if it appears too often, this is not a good sign, especially if it’s followed by pain. In this case, go to your doctor immediately. It can indicate a number of different things, including an ulcer. Peeling skin indicates the lack of certain vitamins. This problem can be easily solved. But, in case this unpleasant symptom is followed by itching, this may be a sign of a fungal infection. Dark circles under the eyes usually appear in case you haven’t slept enough. It’s very important to sleep 7-8 hours continuously every night. Still, these dark circles can be caused by anemia. This happens because the body is unable to produce an adequate number of red blood cells, and as a result, the skin gets dark. Loss of smell occurs with aging and as your nervous system is getting old. But, if this happens to a young person, it may be a result of either a cold or a viral infection. Tinnitus or ringing in your ears may be caused by serious health issues. If it happens often and lasts for long periods, you should visit your doctor. In case you have problems with your eyesight, for example, if you have issues seeing clearly, this may be a warning you’ve become short-sighted or a sign of astigmatism. The best thing to do is to visit your optician if you find yourself with these issues. Blobs may appear in different forms and shapes, as dots, strips, etc. In normal cases, they appear all of a sudden and in front of bright lights. If you are experiencing the blobs more than one week, this may be a sign of cataracts as well as other serious problem with your eyesight. If your eyes are overworked, eyelids twitching may happen. To deal with this, put wet cotton pads on your eyelids. If twitching continues to happen, even if your eyelids are not tired, you should visit a neuropathologist. This may be a symptom of a very serious problem. Some people have loose shoulder joints. This may be an indicator of inborn flexible ligaments. This condition may also be caused by an injury. This may be potentially dangerous and lead to serious injuries as well as dislocation. Check out these other 9 warning signs that your body is over-stressed.